Wearing the briefest of summer dresses, British chart topper Pixie Lott looked fit for summer as she exited Universal studio in Kensington. Wearing a mini shift dress with floral detail, white shoes with her hair tied neatly back, the British star looked effortlessly chic on Monday afternoon in the capital. Pixie Lott arrived at the Universal Head Quarters in Kensington to take part in a digital signing session. She chatted to fans that’d somehow tracked her down through social media networks for over 15 minutes when her hired car went AWOL. Pixie continually experiments with her style and was pictured last week by FLYER at a party in central London. Pixie rocked this denim outfit in style at the Attitude magazine party as she took advantage of the tropical weather in the UK. Not afraid to experiment Pixie has rocked a variety of styles in the capital recently. Harry Styles new rumoured girlfriend Paige Reifler was spotted attending the GQ Warner party in Shoreditch, East London. 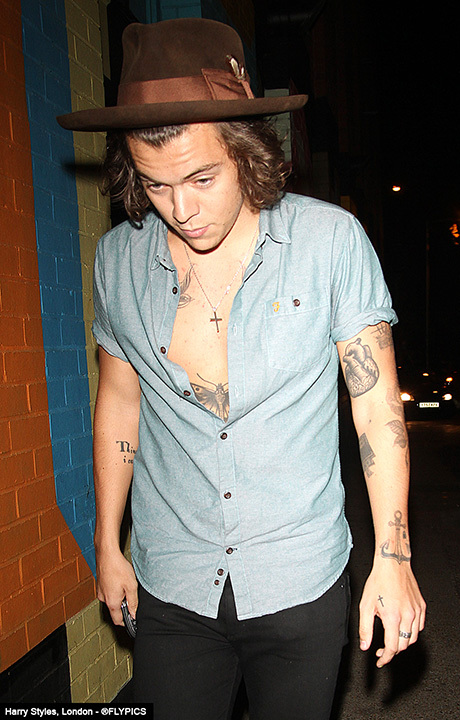 Harry Styles was also pictured by Flyer as he exited the party with a large group of friends which included Paige. Paige was also spotted at the French Connection preview party in central London wearing white (above). Joining Paige was the hugely talented recording artist Melissa Steel. American recording artist Azealia Banks was also spotted at the French Connection preview party in central London.